Due to higher line pressures required with disc brakes, it is recommended that a power assist unit be added to the system. These vacuum assist units are the solution! 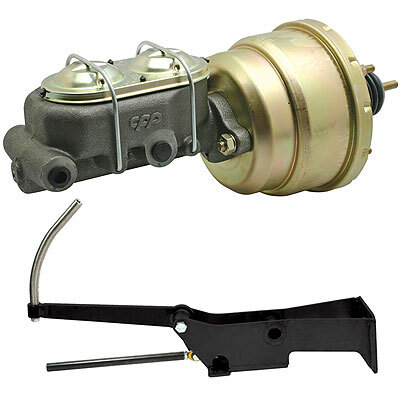 Frame mount booster kits bolt directly to where the original master cylinder mounted (except 1955-57 Chevy car). Some kits include the pedal and others utilize the original pedal. Kits include: booster and frame mount brackets, linkage to connect to the pedal, and master cylinder. Disc/drum and disc/disc kits also include proportioning valve and bracket assembly. Kits available in 7" or 8" and both single and dual diaphragm. If not specified, default booster diameter for your application will be provided. Note: #CP6XX kits do not include proportioning valve assembly.